"This intimate look into the life of one of America's most beloved Catholic personalities is sure to be a classic.The stories are entertaining and vividly written, and each contains a strong dose of life-changing wisdom." "Life Lessons is a practical invitation to prayerful reflection on God's active presence in our lives, especially when and where we least expect to find him!" "Saint Peter's first epistle says, 'Always be ready to give an explanation to anyone who asks you for a reason for your hope.' Life Lessonsis a book full of hope for everyone, especially those who want to grow and experience God's merciful love." 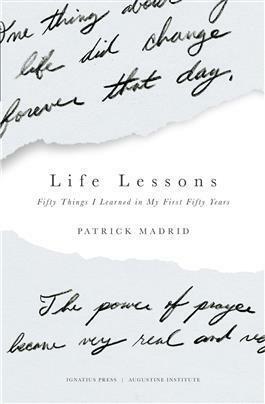 "Patrick Madrid shares the Gospel through short, often funny, and real accounts of the Lord's presence in ordinary moments.This book will open the eyes of everyone seeking Christ's presence in everyday life." Patrick Madrid is a life-long Catholic. He hosts the popular daily "Patrick Madrid Show" on Immaculate Heart Radio, is a frequent guest and occasional guest-host on the "Catholic Answers Live" radio program, and also teaches as an adjunct professor of theology in the graduate theology program at Holy Apostles College and Seminary in Cromwell, Connecticut. Patrick has authored or edited 24 books on Catholic themes, including Why Be Catholic?, Search and Rescue, Does the Bible Really Say That? and the acclaimed Surprised by Truthseries.